The British Museum’s A History of the World in 100 Objects exhibition is coming to the National Museum in Canberra next month, where there’ll be an extra, Australian object added to the collection. Alongside artefacts like The Rosetta Stone, a statue of the Pharaoh Ramesses II and the chronometer from HMS Beagle, will be a set of five unremarkable briefcase-sized metal boxes and two old Dell laptops. Exhibit 101: the WLAN prototype test-bed built by CSIRO scientists in 1993. Their invention made wireless LAN as fast and powerful as the cabled solutions of the time, and is the basis for the Wi-Fi technology now used in billions of devices worldwide. The piece has quite a history of its own. Reaching the museum has been a treacherous journey for Percival and his colleagues. Along the way they’ve been ignored, laughed at, accused of deceit and dragged into court. 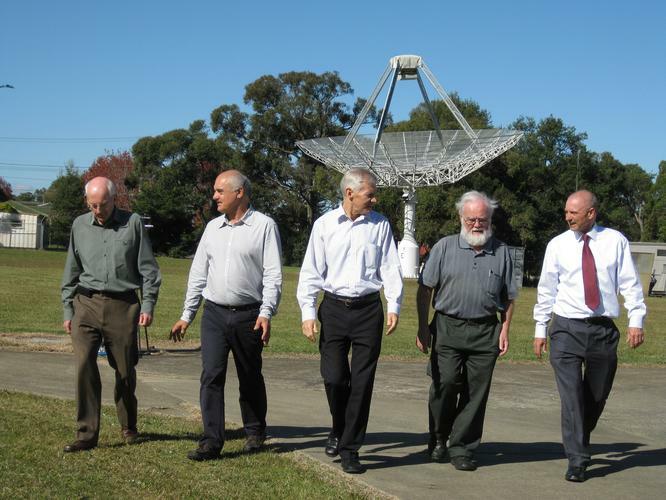 The CSIRO team’s work on a high-powered wireless LAN began in the early ’90s. The agency had bought its first laptops – boasting greyscale displays, floppy disk drives and parallel ports. Experiments happening at the time with wireless connectivity were achieving speeds in the hundreds of kHz. Transferring data without cables requires it to be divided into small portions and transmitted on a number of radio frequencies simultaneously, then correctly reassembled by the receiver. But indoors, these signals are disrupted by walls and surfaces, making the receiver’s job much harder. The CSIRO team, made up of Percival, John O’Sullivan, Graham Daniels, Diethelm Ostry and John Deane, developed technology that used coding, copied data portions and error correction (using techniques from radio astronomy) that could successfully reassemble the disrupted data. “We had this test bed and we were wheeling it around the various office spaces and rooms and it was giving good results,” Percival says. They then built a fully functional prototype in silicon. With a world-changing invention on their hands they patented it and pitched it to big tech companies. Nobody wanted it. In 1999, the IEEE released the 802.11a standard, and recommended the method specified in the team’s patent. A year later, a start-up called Radiata – set up to commercialise the technology – was making the first chips with the technology; it was bought out in 2001 by Cisco. It was in the early noughties that companies started shipping devices that used CSIRO’s patented technology on a massive scale. It began years of legal wrangling with the likes of Dell, Intel, Microsoft, Netgear and Apple attempting to sue the CSIRO and render its patent invalid. Percival and his colleagues were deposed, and in some cases had their day in court. Most companies settled out of court. Some appeal cases are still ongoing. It was tough on the team, but validation came in 2012 when Percival and colleagues won the European Patent Office’ European Inventors Award – presented by Prince Frederick of Denmark and his Australian-born wife Princess Mary. “A good omen,” Percival says. “It’s a defining moment. It makes it hard: Anything else you do people say, ‘Well it’s not as good as that’. It’s kind of hard to beat. A History of the World in 100 Objects opens on 9 September 9 at the National Museum of Australia, Canberra.